I’m rather excited about what I came up with to incorporate both textiles. And the other projects look so fun and wonderful too! Make sure to check out the other 5. I actually created 2 projects – both are quite simple and quick but I really like them both. So you get them both today! This Linen and Leather Cross wall hanging. 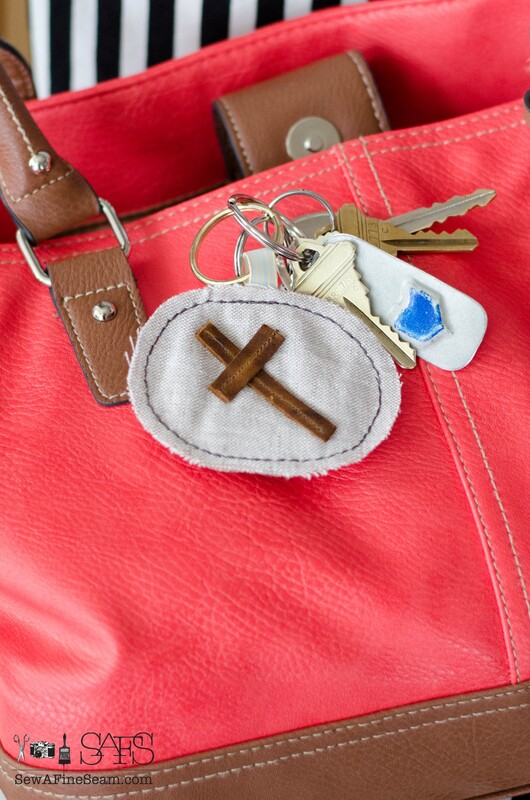 And this Linen and Leather key chain. 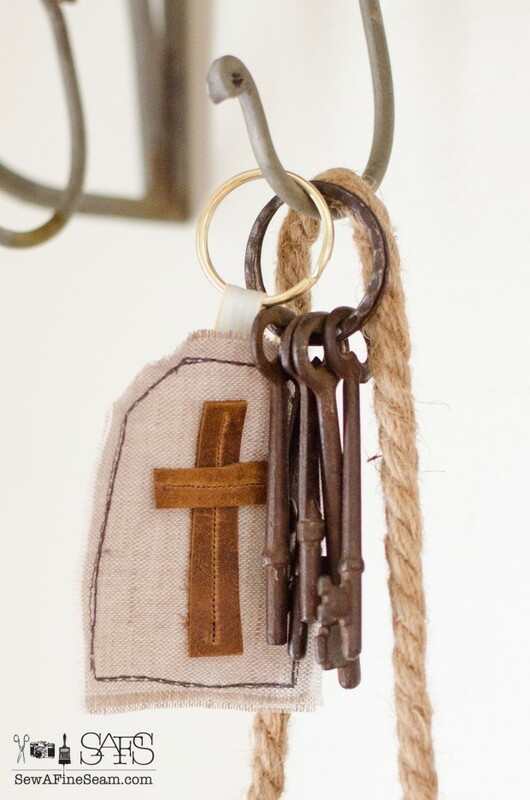 Linen fabric, a bit of leather, and some plain key chains. A bit of thread and my sewing machine, about 15 minutes of time and I created 3 key chains. I don’t have extremely technical instructions – my size was approximately 2×3 and the leather strips I just cut to fit the linen pieces the way it looked best. 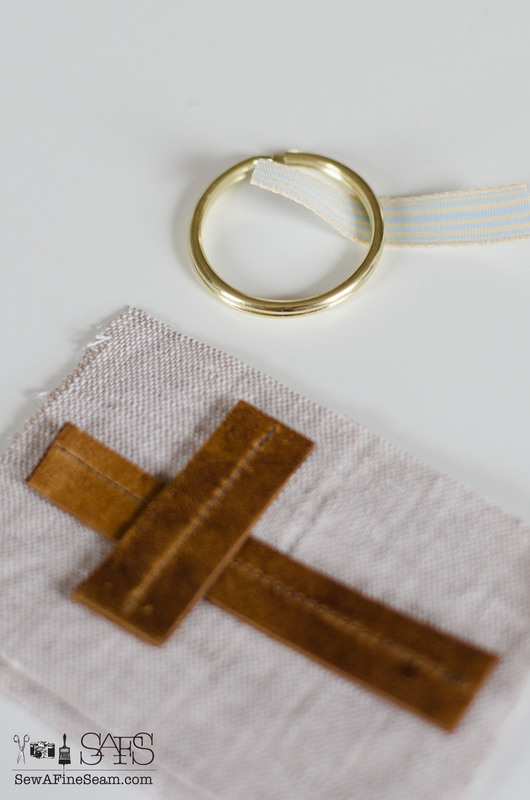 A bit of ribbon became the connector between the ring and the linen/leather fob. 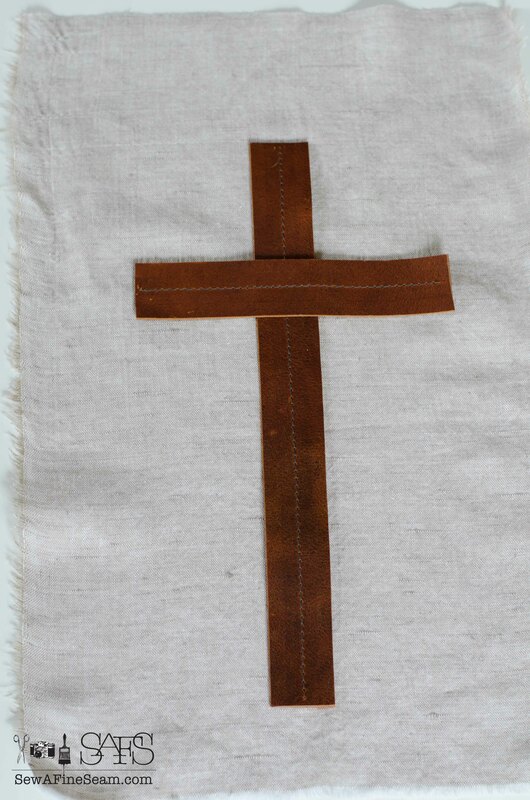 I stitched the leather strips in place in the shape of a cross. This could totally be done with hot glue instead if you don’t want to sew them on or if your machine won’t sew through the thickness of leather. I suggest a leather needle – although I didn’t take the time to switch needles. 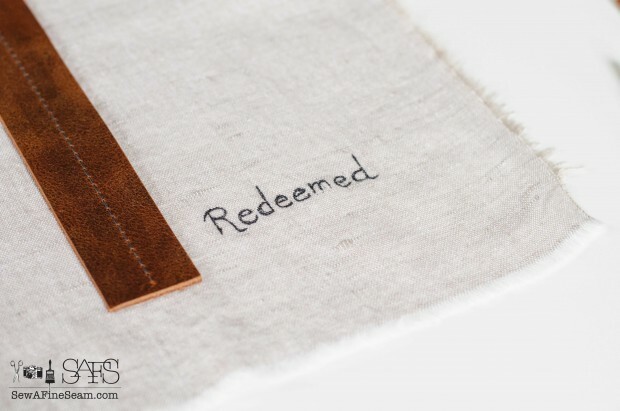 Stitching through leather is hard on a normal sewing machine – if I were doing a lot of leather sewing I would buy an industrial machine. 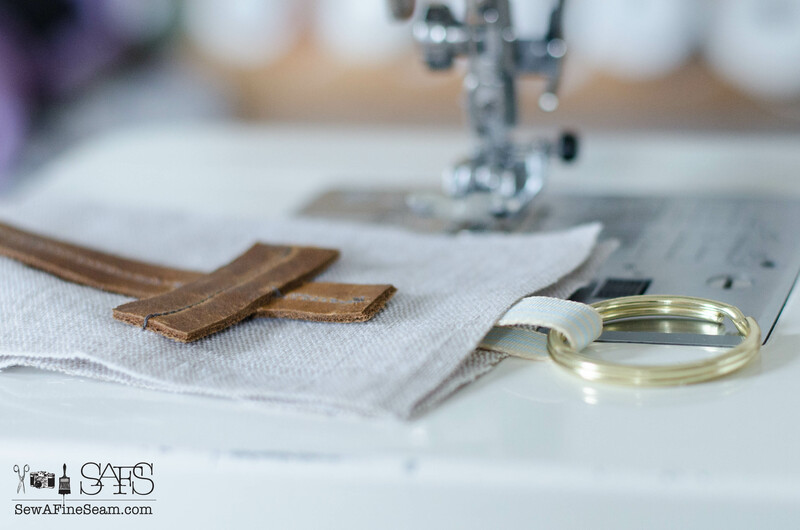 After stitching the leather cross onto just one of the pieces, the two linen pieces can be sewn together, the ribbon connector will be tucked between the two linen pieces and stitched in place at the same time the pieces are stitched together. 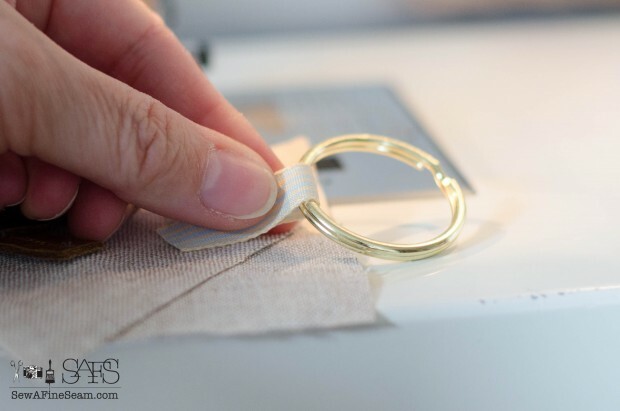 Start stitching at one corner and stitch all the way around. I cut 3 different shapes/sizes. I also used a triple stitch that is built into my machine. I like the look of the heavy stitch and I like that it gives it extra durability. 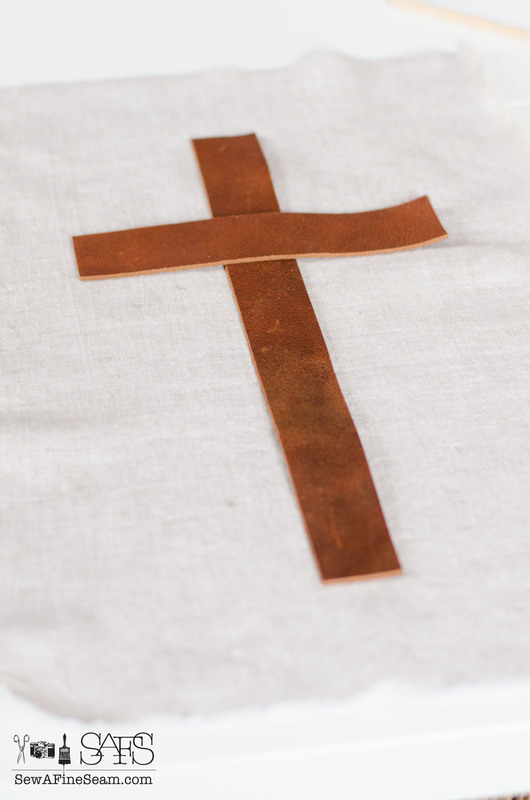 Stitch leather pieces on ONE piece of the linen in a cross shape. 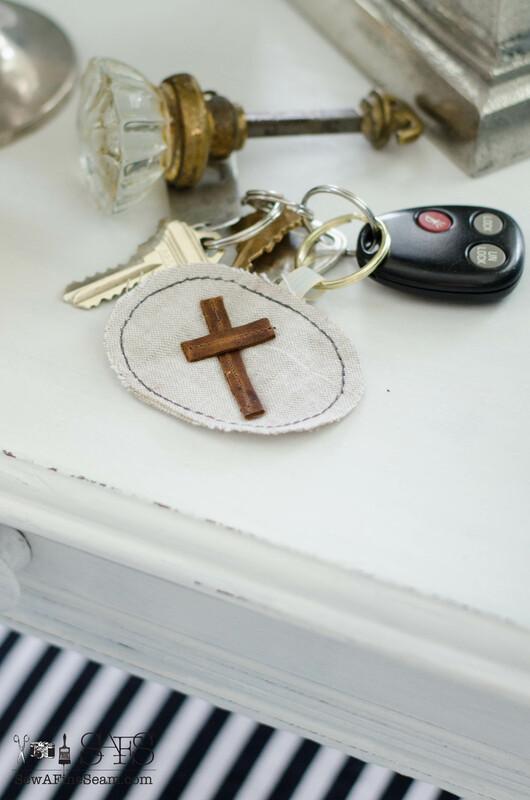 Use a thin Sharpie marker to print a word beside your cross if you want to. Stitch a double row of stitching across the top of both pieces of linen, securing both pieces together, and leaving enough space between them for a dowel rod to fit through. I used a 3/8″ dowel I think – you can use whatever size you want, just leave enough space for the rod to fit through between the stitched lines. 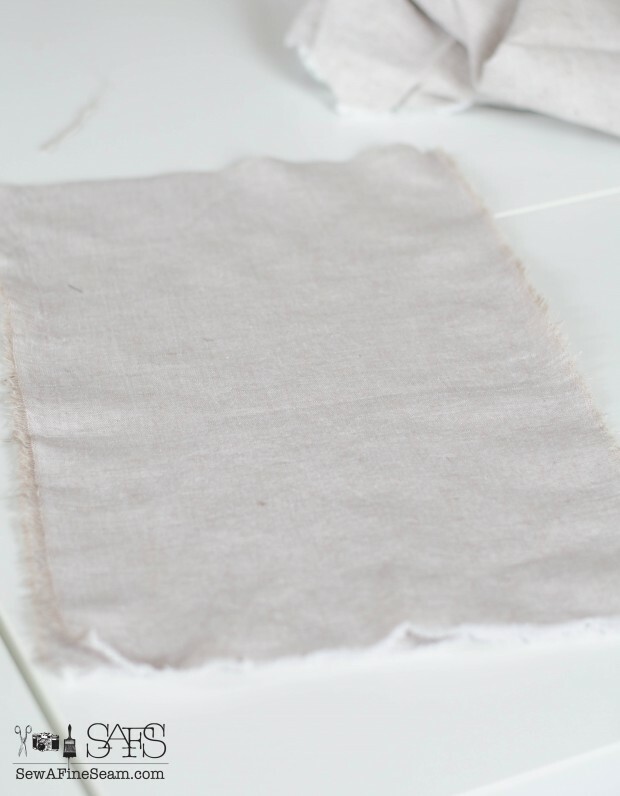 After stitching the top lines, stitch the other three sides of the linen together, starting and stopping at the second top line of stitching at the top of the wall hanging. I needed my dowel rod cut down and since I was working on this last minute and my hubby was at work I had to come up with a way to cut that dowel myself. Without making it split out when I cut it. So I grabbed the bush trimmers I keep handy for when I want to cut some sticks or something outside and used them. It worked! 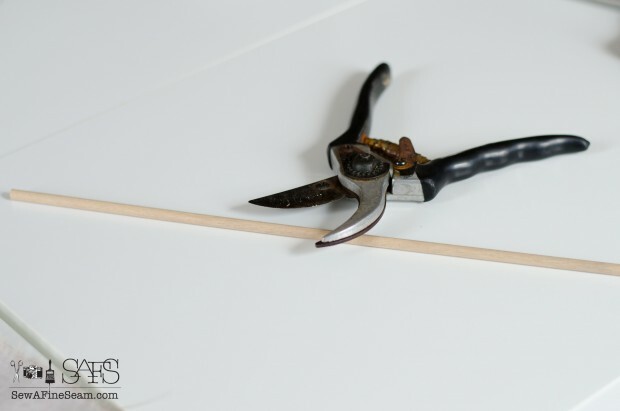 I cut my dowel to about 15 inches but you can totally do this however it looks right to you. To hang it I simply tied some bakers twine to each side of the linen and hung it. I frayed the edges of the linen, especially at the bottom. 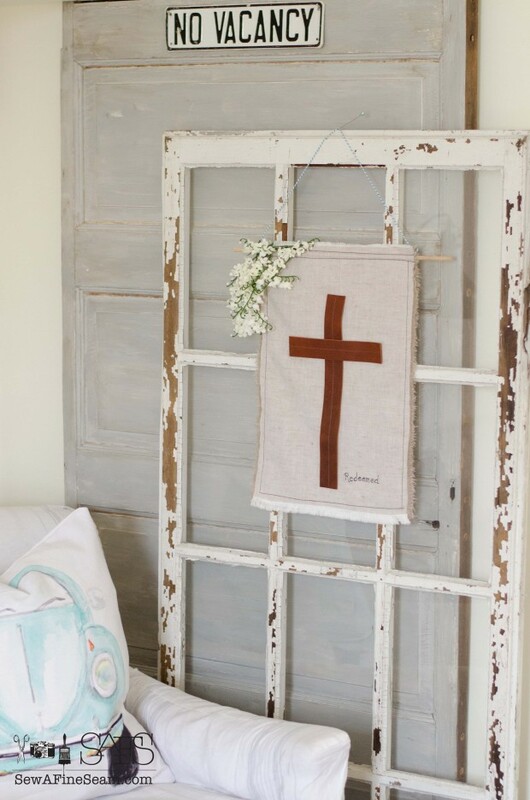 The linen and leather wall hanging is now hanging beside my chair on the old window I have against the wall there. I rather like it with the faux lily-of-the-valley. And I added one of the key chains to my keys. I rather like it too. And I’m thinking of adding both of these projects to my Shop. What do you think – should I? Now go visit my friends and see their projects this month. Not only clever, but very sweet. I love that you made a matching key chain too!! 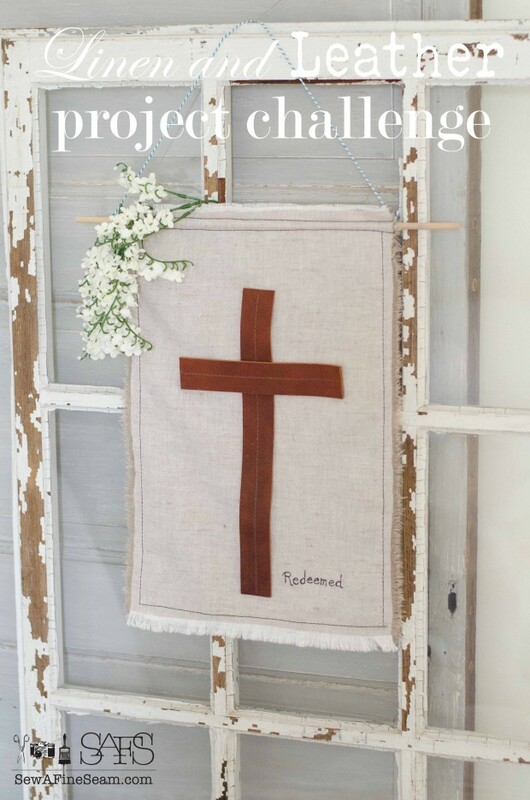 What a fun and easy project! I think my kids would love to have a crack at this and what better time than Easter? Thank you for sharing, Jill! Good Friday Morning,Jill! 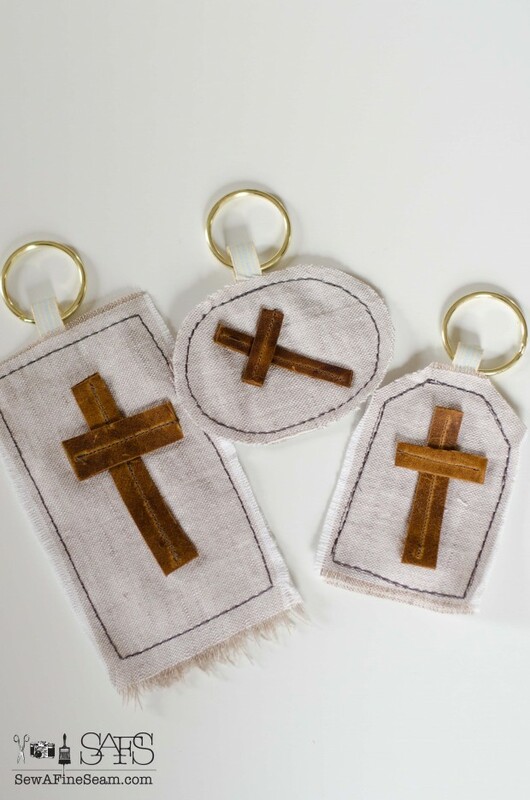 Your cross on linen is precious. 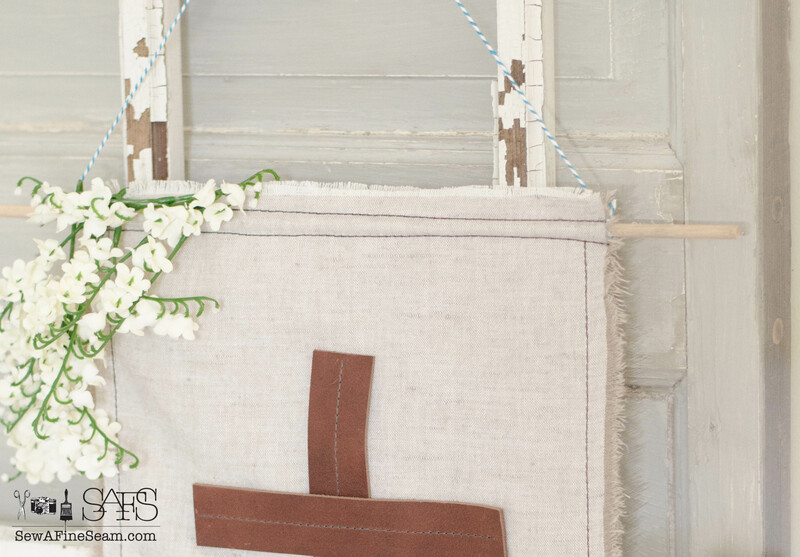 I think we all chose linen because it speaks spring. Perfect idea, Jill! First of all I’m so impressed because you used both linen AND leather!! Secondly I just loove your projects!! They are so wonderful!! Your post is so well written too. I have trouble merging the whole explaining what Project Challenge is and talking about my project. Next month I may have to cut a paste a paragraph from your blog! lol! Have at it Lisa! I never know for sure how to incorporate it all either so I just do it – somehow! 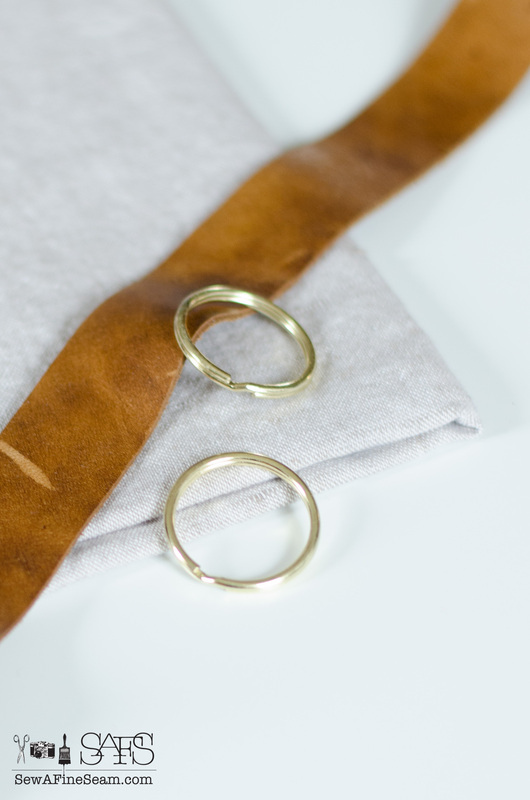 I love that you used both leather and linen–I thought this was ribbon at first glance. Love the little keychain too! 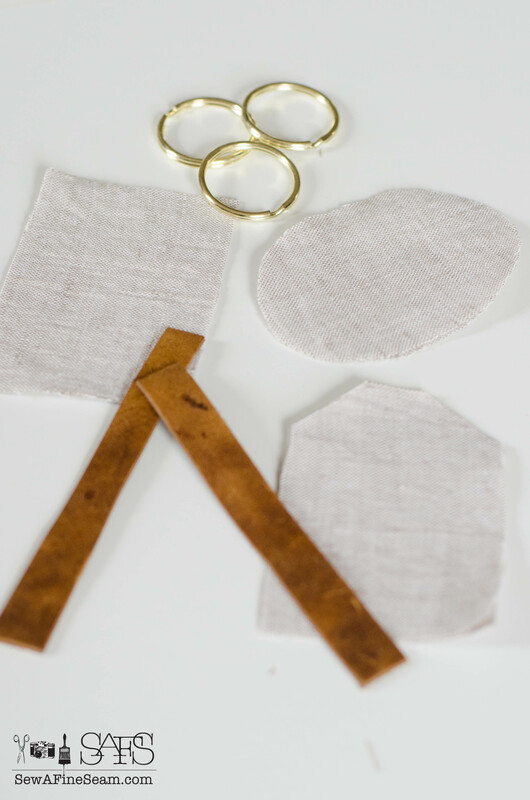 You totally could use ribbon – would be easier to sew on if your machine didn’t want to do the heavy duty leather!